We tend to anthropomorphize animals; it's an enormous part of the earliest tales we are told as children. In his exhibit Some Thoughts, Gary Jacobson's sculptures of animals exist in an emotional tone that triangulates humor, affection and enmity. "Jonah and the Whale," "The Tortoise and the Hare" (pictured) and "The Man in the Moon" remind us of those childhood tales, but with a twist. The hare's leg is in a trap; a camel is about to drop from the top of a staircase. 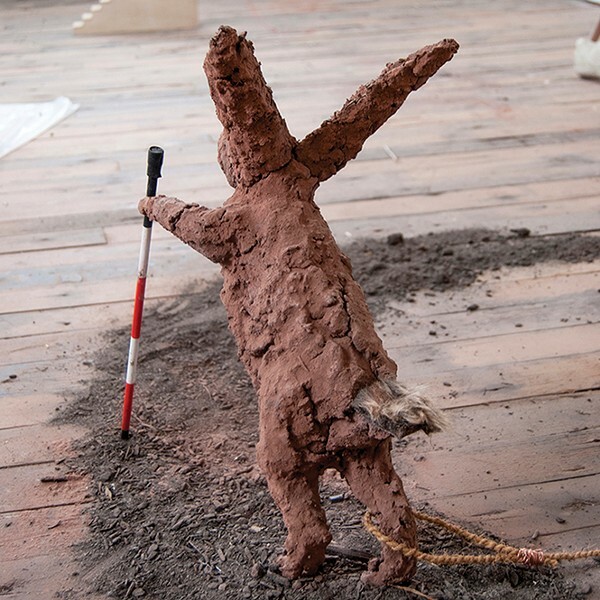 The use of unfired clay, and their roughly rendered shapes, suggests that these creatures are not fixed in their materiality, but are still nascent, in the process of developing into their mature forms. The narrative moments depicted by the dioramas make the dreamlike direction of the stories go awry, so that not only the creatures but also their predicaments are those of an alternate space. If you were a fan of Alton Brown's Good Eats on the Food Network, you know the genius behind the show's ability to explain the science of food through comedy. 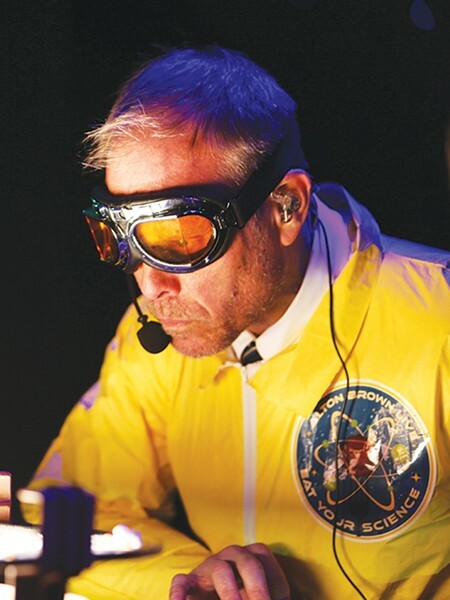 Brown's second iteration of the Eat Your Science tour is back this year with an all-ages live show including puppets, music and multimedia presentations. Brown plucks volunteers from the audience to share a little comedic banter and assist him in executing big, potentially dangerous experiments. Sounds like fun, right? To give you an idea of what's in store: One of the experiments Brown performs includes cooking a shrimp-and-pepperoni pizza in a 900-degree apparatus which he invented himself in the eighth grade. Originally, it was supposed to be powered by a bicycle wheel, but they had to replace it with a ship wheel they found at a pawn shop. Another experiment had him funneling a chocolate cream concoction in an air-compressed tank on one end of a machine made entirely of parts from a hardware store, and on the other end sat a tank of pressurized CO2 gas. Both are blasted into a freezing chamber, creating a temperature of about 150 degrees below zero, and ta-dah! A gallon of ice cream is made in 10 seconds. The customary criteria for being a successful comedian often demand that politics, pontificating and profanity are incorporated in equal measure. 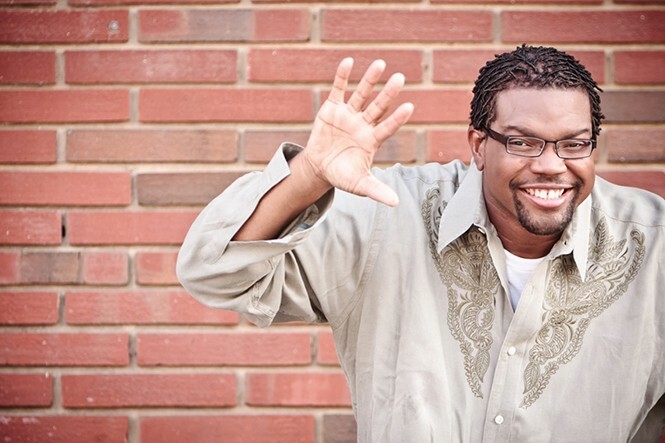 So credit Vernard "Bone" Hampton with defying the norm through a stand-up style that takes its cues from his Christian faith. Granted, you don't find many performers using their faith to entertain a mainstream audience, but Hampton clearly doesn't fit the norm. A former football player for the University of North Texas—where he gained the unlikely nickname "Bone" in contrast with his obvious girth—he embarked upon a comedy career after a chance discovery by actor/comedian Jamie Foxx. Entertainer Steve Harvey became his mentor and from then on, Hampton quickly accumulated credits that include stage, screen and sitcom gigs. He's made multiple appearances on The View and BET's Comic View, while collecting film roles alongside Sandra Bullock (All About Steve), Sean Austin and Jon Voight (Woodlawn). And then there's that popular commercial for (appropriately) Church's Chicken. While Hampton's success over the past 20 years is undeniable, he dismisses the idea that working "clean" was an obstacle early on. "I wasn't concerned because I have an aggressive, delivery, approach and tone," he says via email. "[It] allows me to camouflage the words and content I choose not to explore." Just a few years ago, podcasts were something only the most die-hard NPR fans were even aware of. Now it seems there's a new show every day, with podcasts becoming mainstream—thanks, in part, to one series that set the pace. In 2014, with the Serial podcast, Sarah Koenig and Julie Snyder entranced listeners with the gripping story of Adnan Syed, a high school senior charged with the brutal murder of his ex-girlfriend. Closed in 1999, the case is violent and complex, yet was told with such finesse it feels more like a well-written thriller than a true story. Koenig and Snyder took listeners on an astonishing trip to discover the truth with new twists and turns over the course of 12 weekly episodes. 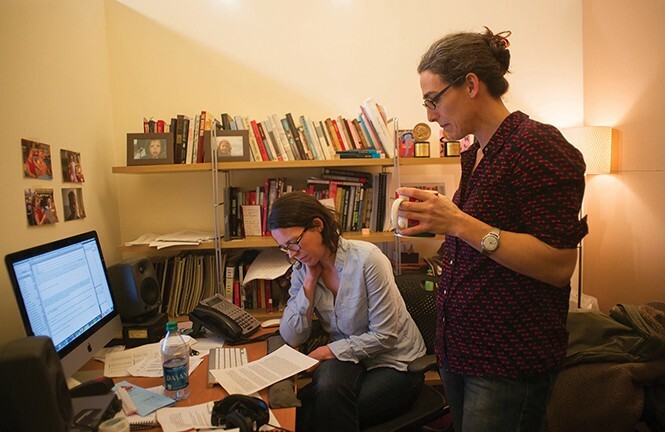 Serial broke the record for the fastest podcast to reach 5 million iTunes downloads. A Peabody Award in 2015 cemented its place as a national sensation.